I can't believe it's happening in my lifetime. The absence of a release date didn't stop me from picking Mount & Blade 2: Bannerlord in our PC Gamer 2019 Fantasy Draft, and my decision could soon be vindicated. TaleWorlds very casually slipped the mention of an upcoming closed beta into a recent developer blog update, like it was no big deal after seven years. It is a pretty big deal, though. Mount & Blade is one of the best RPGs of all time, and the sequel is promising to be an even richer blend of roleplaying, strategy and simulation, but it's yet to be shown off outside the controlled confines of events and previews. What exactly the closed beta will entail has yet to be announced; all we know at the moment is that the "upcoming" closed beta will be detailed in a future blog update. Given TaleWorlds' hesitance about announcing a release date too early, I suspect that the closed beta won't be far off. The update itself was concerned with multiplayer skirmishes, where players can beat each other up in 6v6 battles. You'll also be trying to capture and hold points, like in Captain mode, but there are no bots, just you and the other players. Because these battles will be asymmetrical, with powerful armoured knights charging into pitiful serfs who've just been tossed a sword, spawns are tied to the quality of your class. Every player gets a set amount of points to spend on a class to spawn as, but you'll run out of points faster if you keep going for the best warrior. 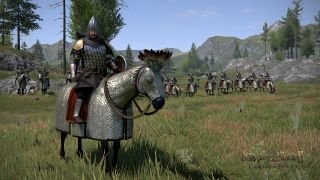 With the closed beta looming, brush up on the game by checking out everything we know about Mount & Blade 2: Bannerlord. So! What do we reckon? 2019 release date?